‘As women, we must stand up for each other,’ wrote Pakistani social media celebrity Qandeel Baloch to her 43,000 Twitter followers. Four days later, her brother, Muhammad Waseem admitted to killing the 26-year-old by drugging her and then strangling her. He told a press conference, ‘I have no regrets’, as he confessed to killing her for ‘family honour’. More than 500 people, almost all women, die in Pakistan each year in so-called ‘honour killings’, usually carried out by a member of the victim’s family for bringing ‘shame’ on them. Described as ‘Pakistan’s Kim Kardashian’, Qandeel Baloch had built up 43,000 Twitter followers and more than 700,000 Facebook followers. Hailed by young fans for her liberal views, often posting selfies and describing herself as a voice for girl power, her posts were often deemed controversial in conservative Pakistan. 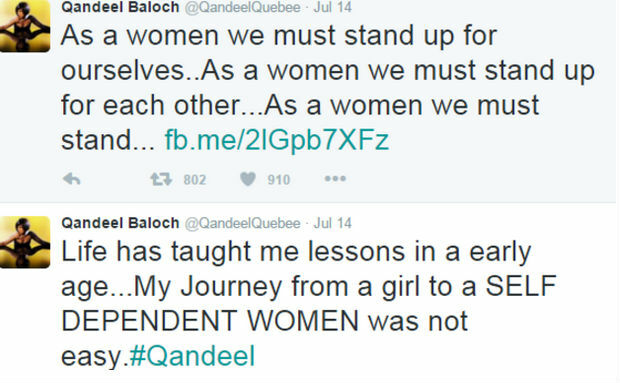 Despite receiving an onslaught of misogynist abuse online, Baloch continued to post defiant tweets. ‘I will not give up. I will reach for my goal & absolutely nothing will stop me’ she once tweeted. The world has now been shocked by Baloch’s killing (real name Fauzia Azeem) and outpourings of grief have flooded social media. Many in Muslim Pakistan are now desperately calling for an anti-honour killings law to be rushed in – currently, murder cases fall through a legal loophole that doesn’t hold family members accountable.